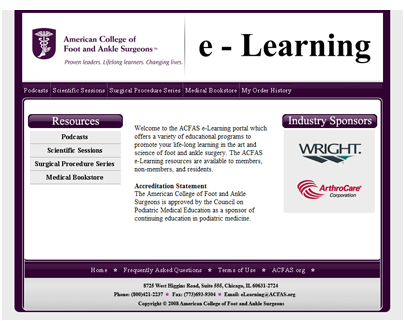 The American College of Foot and Ankle Surgeons (ACFAS) wanted to increase the number and type of educational offerings available to members online. Ian Ryan Interactive worked with ACFAS to develop a series of audio podcasts, and two series of video-based eLearning programs. Scientific Sessions are typically dialogues between physicians, and a Surgical Procedures Series that includes actual surgical footage recorded in a clinical environment or at their various educational seminars. These elements are then posted on a mini-site that IRI built and hosts for ACFAS. We built the pages to the client's in-house graphic design specifications and host the entire e-Learning component for them. User registration, log-in, and payment is handled via the existing ACFAS site, and the user is then seamlessly bounced to IRI's server for delivery of all e-Learning content.